Kernan Forest community in Jacksonville, Florida. 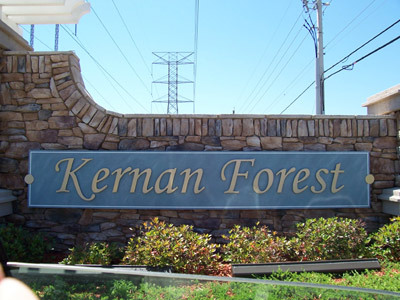 Kernan Forest is a new residential community located on Kernan Drive about 1.5 miles north of Atlantic Boulevard. Kernan Forest offers something for everyone in the family, with plans for a large pool, water-activity center for children and a clubhouse. Kernan Forest's location places homeowners just minutes from the conveniences of downtown, Regency Square, Southside and the Beaches. Additional road improvement plans, including the Wonderwood Connector that will link Mayport Road to 9A, indicate that local leaders recognize the desirability of the area. The Residence at Kernan Forest offers single-family homes with eight floorplans ranging in size from 1,719 square feet to 3,489 square feet. Homesites from the mid $200's. Just across the roundabout from The Residence at Kernan Forest is Hammock Grove, a community that is perfect for home buyers seeking the convenience of maintenance-free living within a gated, multi-family condominium village. Centex Homes offers four individually designed floorplans at Hammock Grove starting in the mid $100's that are well-designed, gracious in size and feature luxurious two- or three-bedroom suites and attached one car garages. The Residences at Kernan Forest and Hammock Grove share a beautifully treed and landscaped environment replete with walking trails and sidewalks for jogging, biking, and rollerblading. The neighborhoods aslo have an elegant clubhouse, pool, water activity center, multipurpose courts and playground equipment.